Every Saturday from 4 to 18 August, Mini-Europe will stage an impressive light and sound show for its visitors. On three consecutive Saturdays, the façades and gardens of the miniature park will be lit at night, providing a fascinating display of light and shadow which will emphasise the details of the scale models and highlight aspects that may not have been noticed until now! This simply magical evening will culminate in a musical fireworks display scheduled at 22.30 hrs. This year once again, the miniature park in Brussels will be staging its traditional son-et-lumière show. On Saturday, after sunset and until midnight, an incredible cocktail of lights will create a fairytale atmosphere. This 23rd edition of ‘Mini-Europe by Night’ will be even more festive than previous years, because it takes place in the context of EU-China Tourism Year (ECTY2018). On this occasion, visitors will be able to discover some life-size historic Chinese lanterns in the park. They will be exhibited until the end of August. Thanks to an amazing interplay of shadow and lighting in yellow, blue and red hues – representing the colours of the flags of the EU and China – every detail of the most famous European buildings and monuments will be more eye-catching than ever. This fantastic spectacle with its Chinese/European atmosphere will leave an indelible memory in the minds of young and old alike. The evening will be enlivened by a medley of Chinese and European music. And, icing on the cake, this year the musical fireworks display – set off at 22.30 hrs. – will be preceded by a show of traditional Chinese dance. The light and sound show, a real feast for the eyes and ears, will not cost visitors anything extra: the usual admission charges apply. 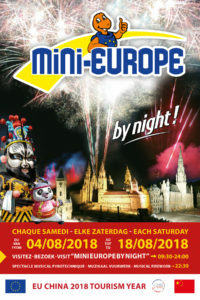 There’s ANY EXTRA CHARGE for people wanting to visit Mini-Europe by Night! The visitors have to buy a normal ticket. Please note that if you want to discover the park during the day and come back in the evening for the firework, it’s possible ! Just say it while you’re purchasing your ticket and you’ll get a stamp with the logo of Mini-Europe. With this stamp you’ll be able to enter the park again in the evening.